And don't delay! 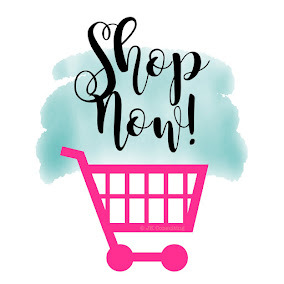 Get a FREE Sale-A-Bration item with every $50 in merchandise that you order! 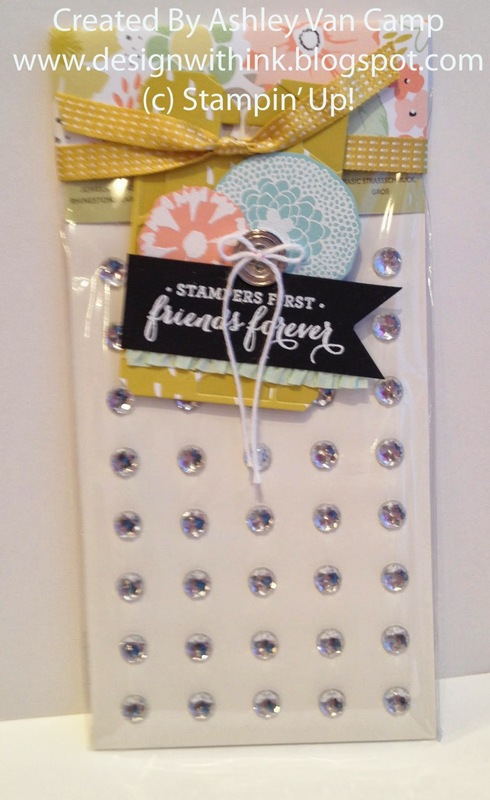 Great time to stock up on card stocks, adhesives, embellishments, etc! 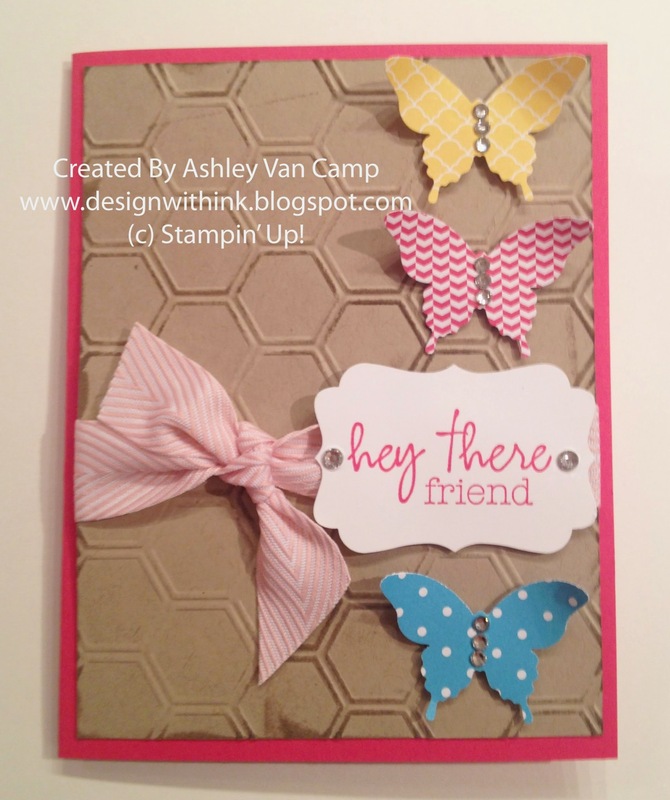 Just drop me an email at designwithink@gmail.com or just order right on my website... www.ashleyvancamp.stampinup.net Let me know if you have any questions! 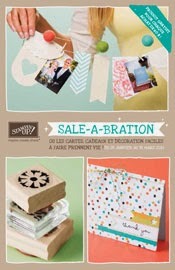 Also...Sale-A-Bration is a FABULOUS time to become a demonstrator! 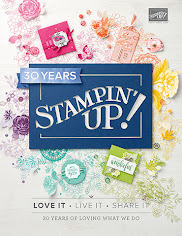 Sign-up by today and get $150 worth of Stampin' Up! merchandise for just $99! With FREE shipping!!! AND....the best deal of all...sign up now and you also get FREE CONVENTION REGISTRATION!! You can NOT beat that! Email me for details! 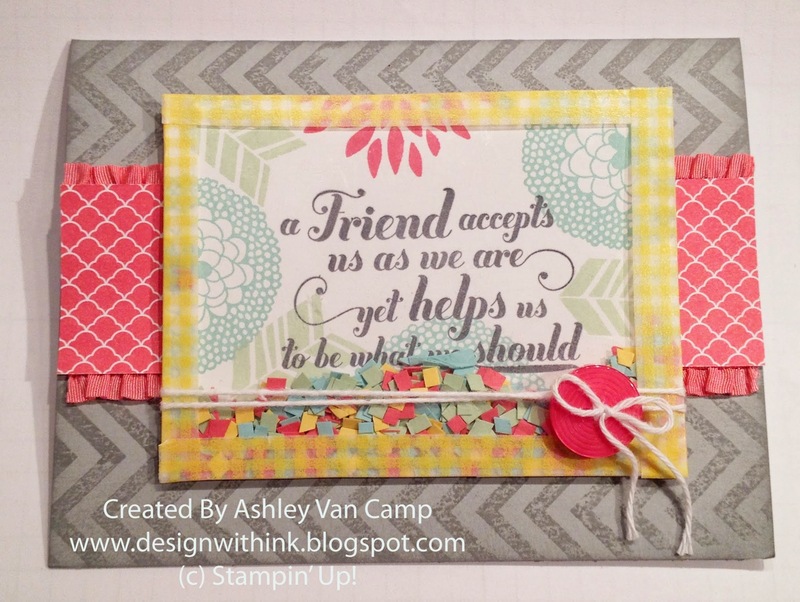 Then today is the last day for the FREE MARKERS promotion with Paper Pumpkin! I just canNOT stress enough about how happy I get when my bright orange box comes each month. It's SO MUCH FUN! Sign up by the end of the day for a Paper Pumpkin subscription and new subscribers get a FREE pack of 2012-2014 In Color markers! You can't beat that! Just try it...I know you will love it! 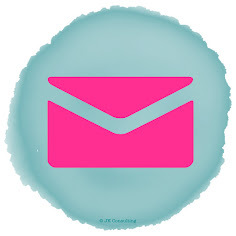 The first month of your new subscription you will get the welcome kit. (It is the kit shown in the picture above.) It has some of my most used stamps in it! 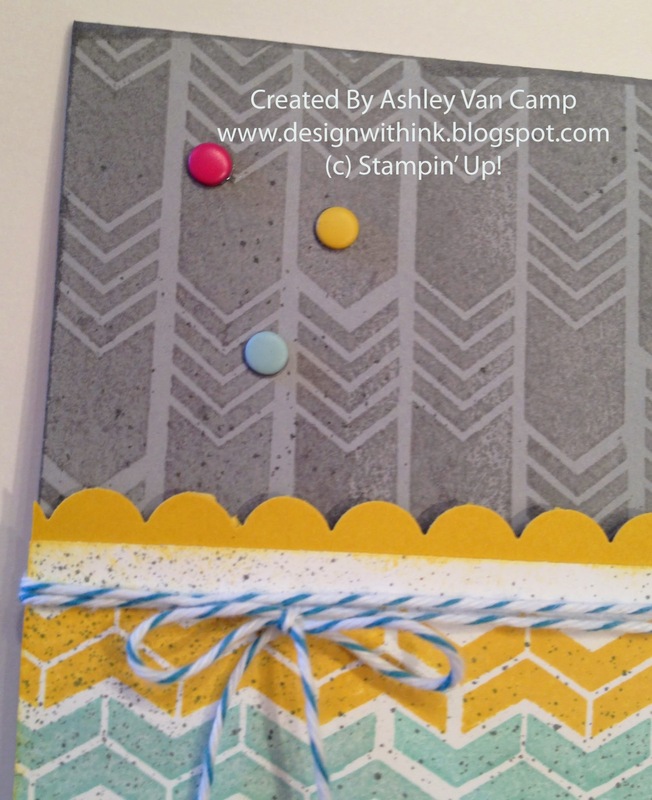 The cards you make are super fun with the kit, but after the kit is done...you still have the stamps to use! YAY!!! 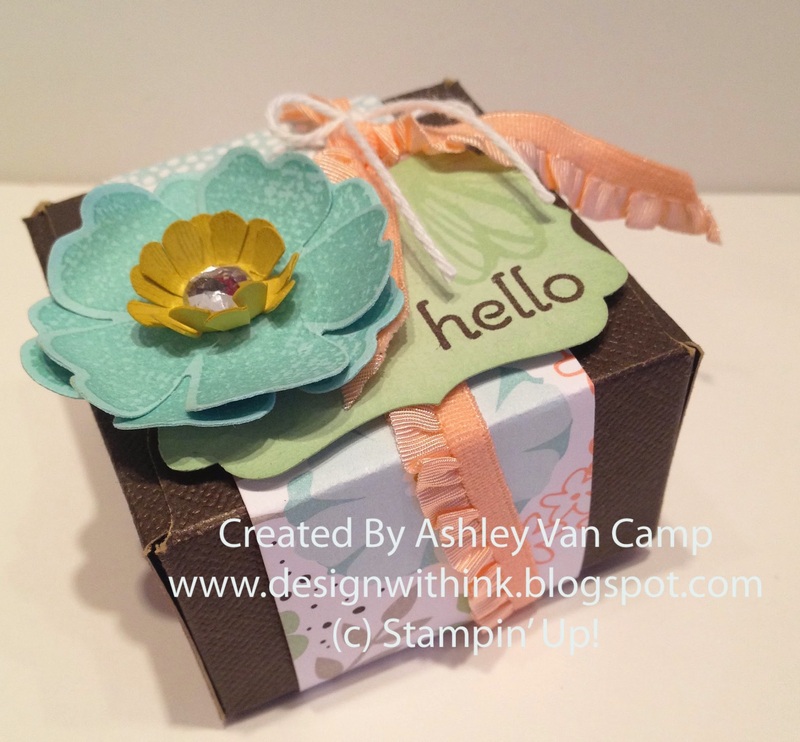 So I want to show you a few more samples made with these stamps. These samples were actually part of our make and takes for the demonstrator event I went to recently. 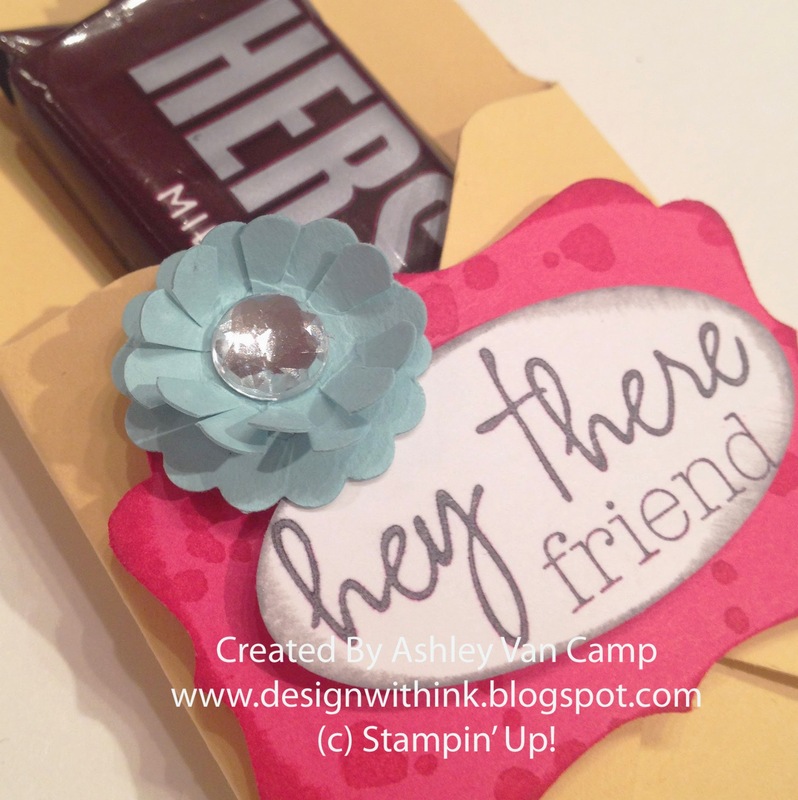 (Another FABULOUS perk of being a demonstrator...you will be involved with an amazing group of demonstrators! And you could go to fun events like this with me! :) ) I posted about this event in THIS post, THIS post, and THIS post. At these events I tend to chat away though, so I didn't get many of my make and takes completed. Then when I sat down to make these projects at my house...I couldn't find my pictures that I took to remind me of what we were making. :) SOOOO...I was going off of memory making these. 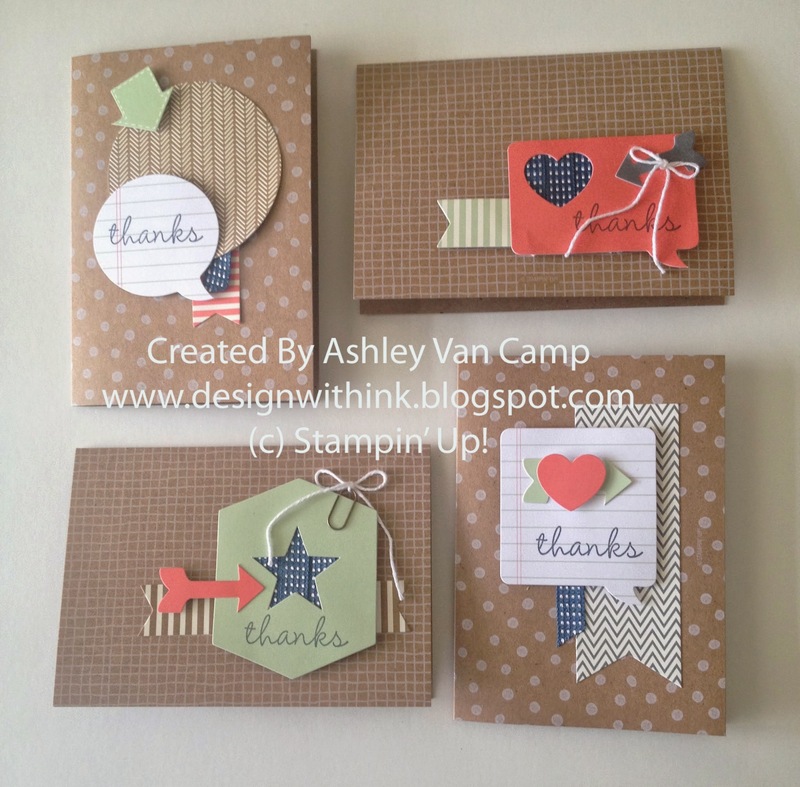 I think these projects are pretty close to the originals, that were created by the fabulous Heather Stevens. I just added a few extra pieces to the kits I had. How fun is this card?! 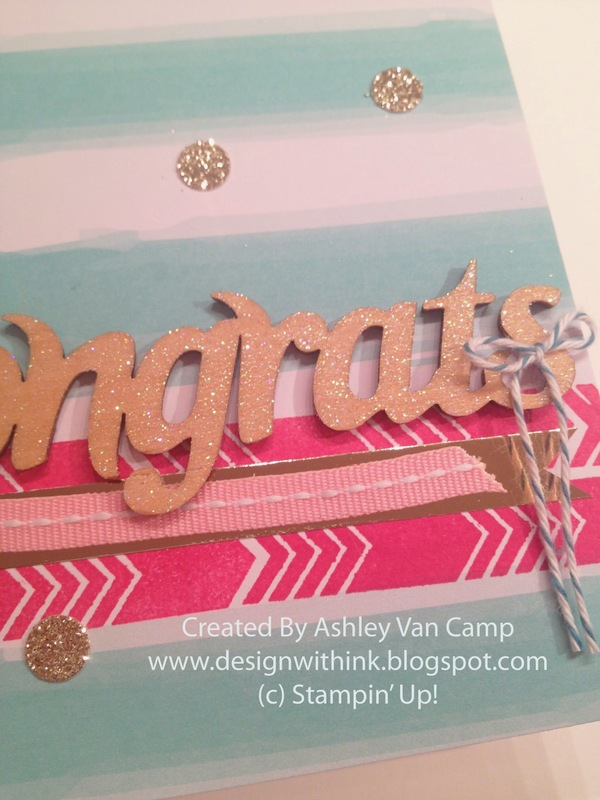 That embossed background is a Sale-A-Bration embossing folder! Get it FREE today!!! 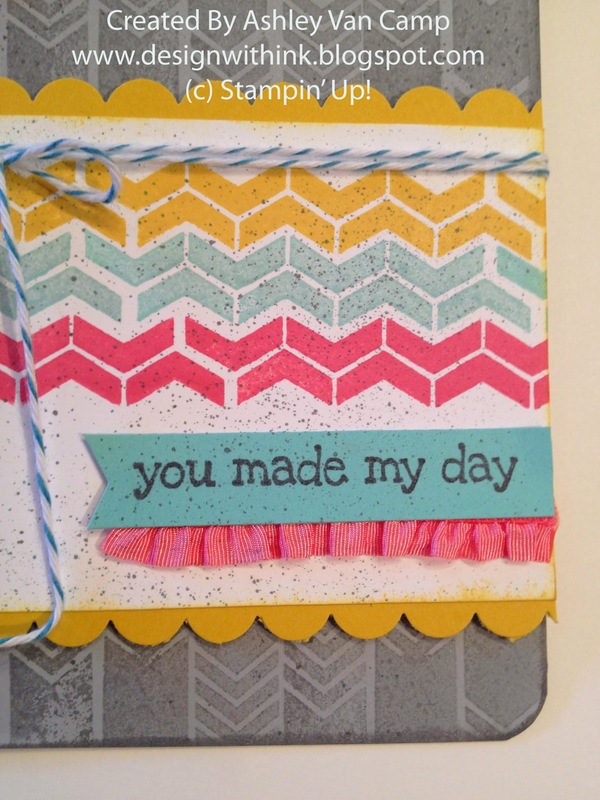 Then LOVE LOVE LOVE that ruffled In Color ribbon (this one is Coastal Cabana). LOVE the details that adds. 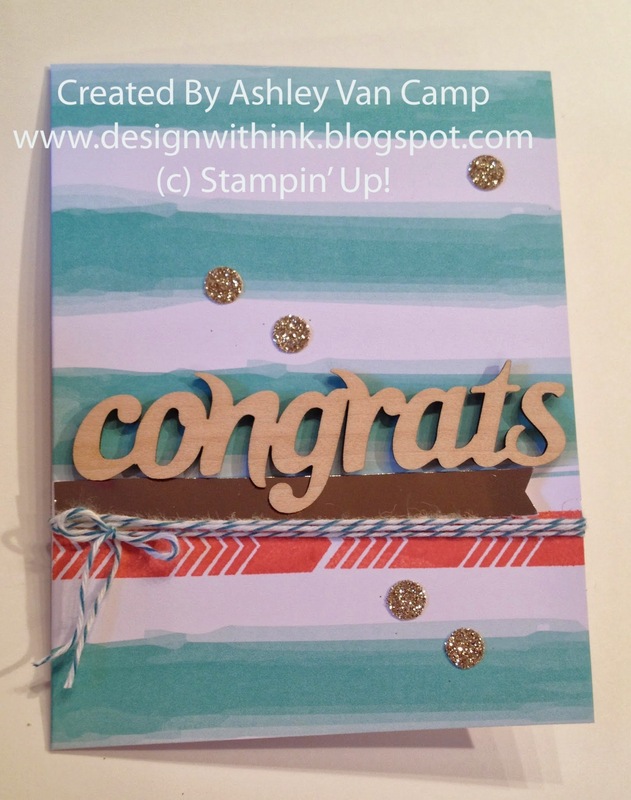 And silver glimmer paper...can NOT beat that!! I think this is a fun and fresh card. How fun, right?! Love that little flower. It's just made with the 7/8" Scallop Punch. Then I just cut slits in the valleys of the scallops to make the petals pop. Hope you enjoy these projects! Just let me know if you have any questions! Thank you SO MUCH for visiting! 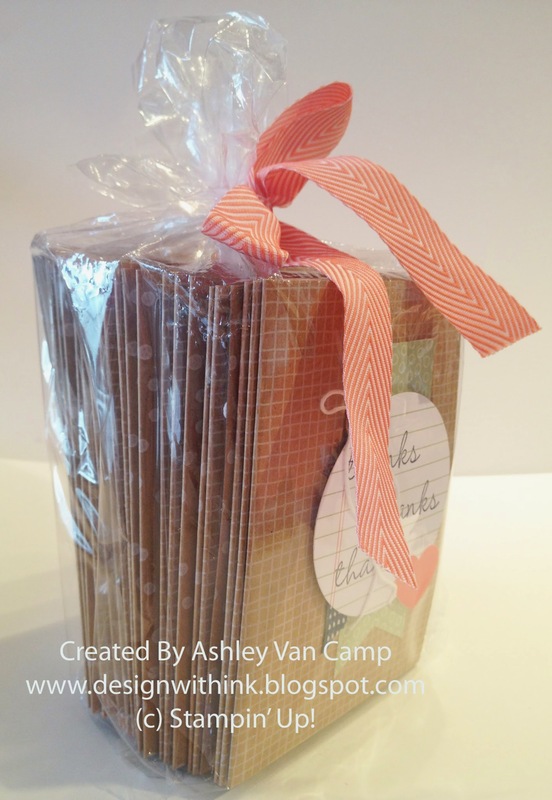 You get the supplies to make 20 darling cards and envelopes. 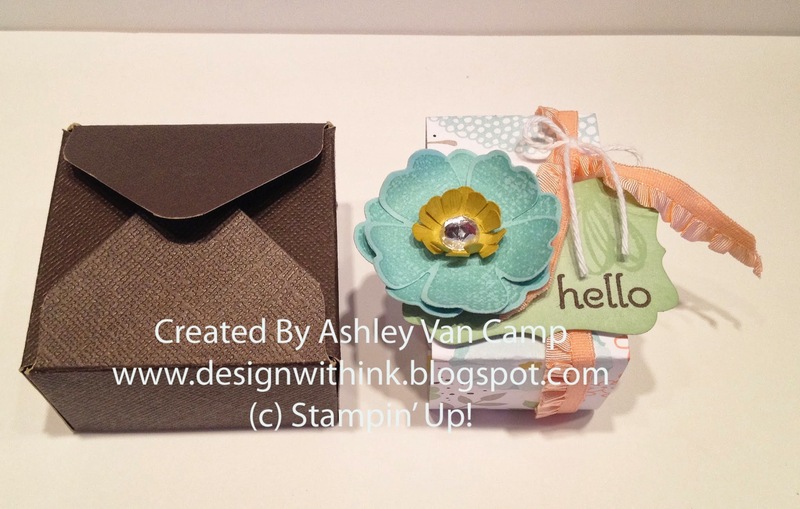 You also get a stamp set, a clear stamp block, etc. And the cards are SO CUTE! Well...a side note...my brother is getting married in May. 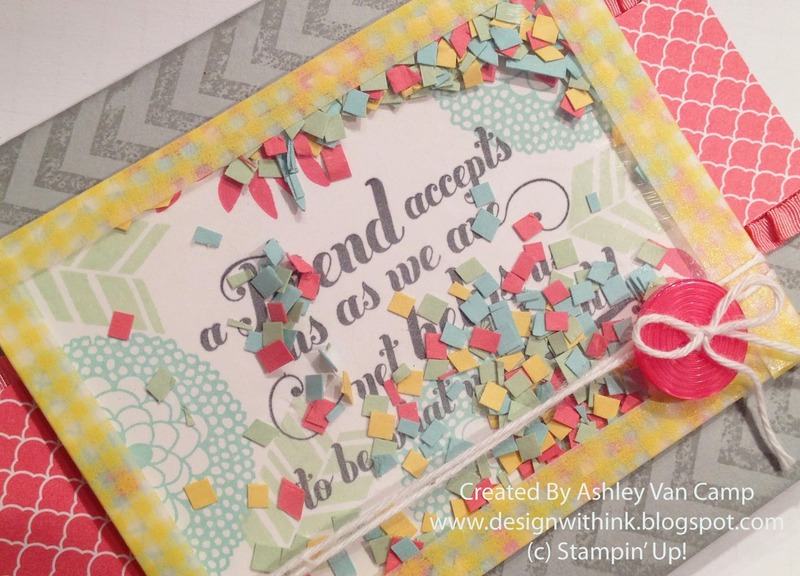 His fiancé chose some cute colors for their wedding...and they just happen to be basically the colors in the card kit! The only color that was missing was Navy. 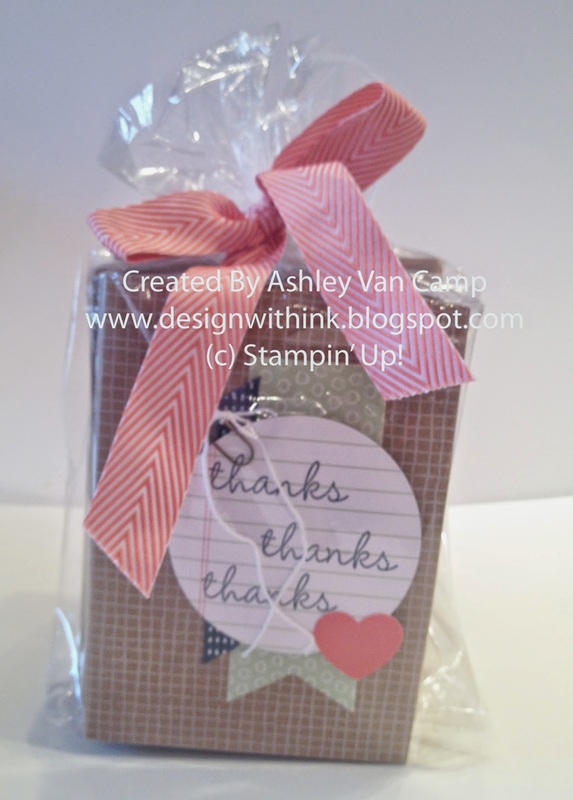 (Her colors in Stampin' Up! language are Baked Brown Sugar, Calypso Coral, Pistachio Pudding, and Night of Navy.) 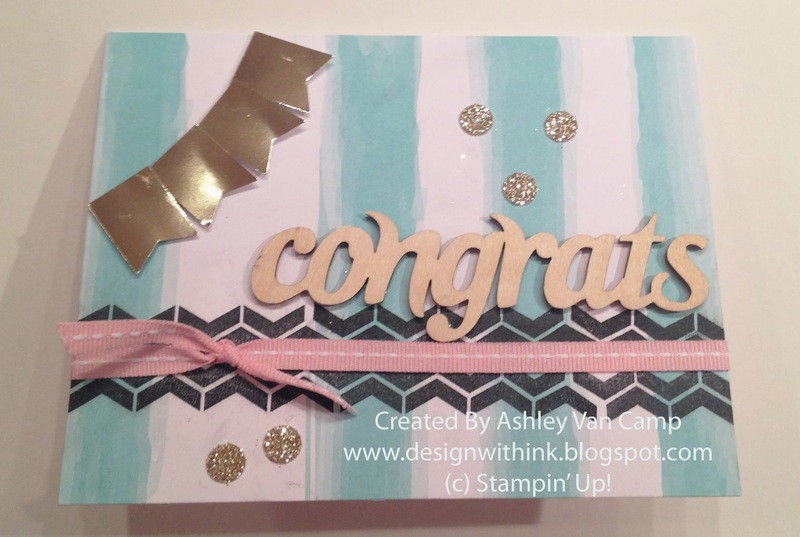 Anyway...she had a bridal shower last weekend and so I had to make her these cards as part of her gift! I have to say...it was a fun project! 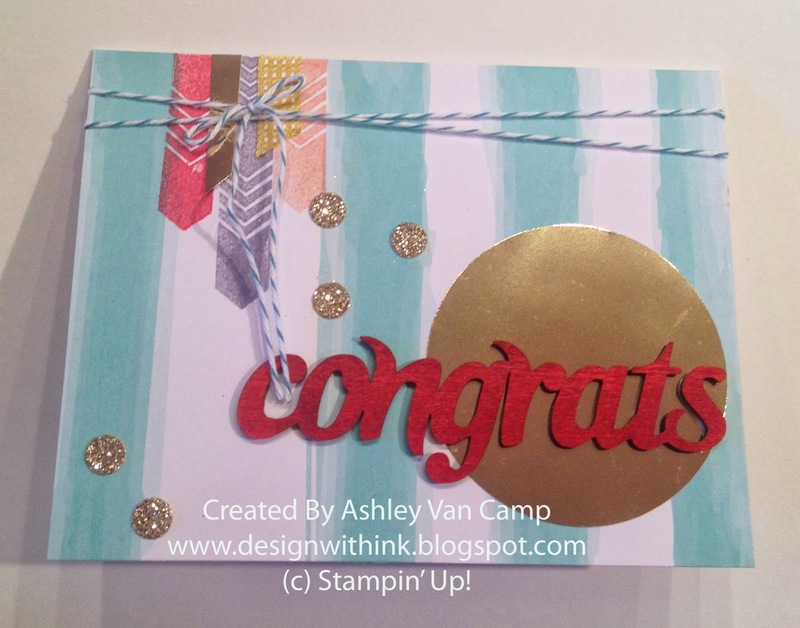 I added some Midnight Muse ribbon to the cards to bring in the Navy color. And instead of using all the other sayings that came with the kit (that are darling! 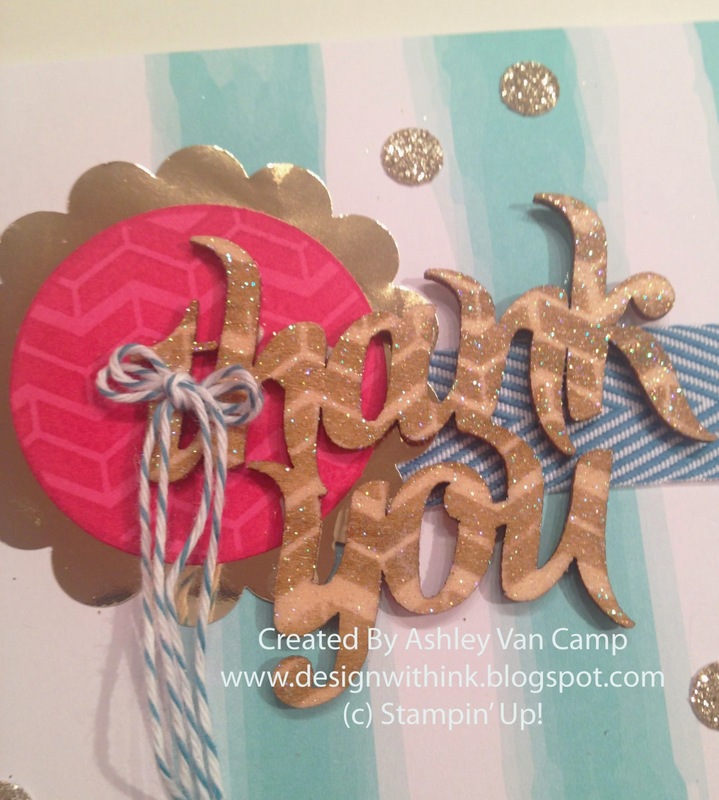 )...I decided to just use the "thanks" so she had 20 thank-you cards all ready to go. So fun, right?! 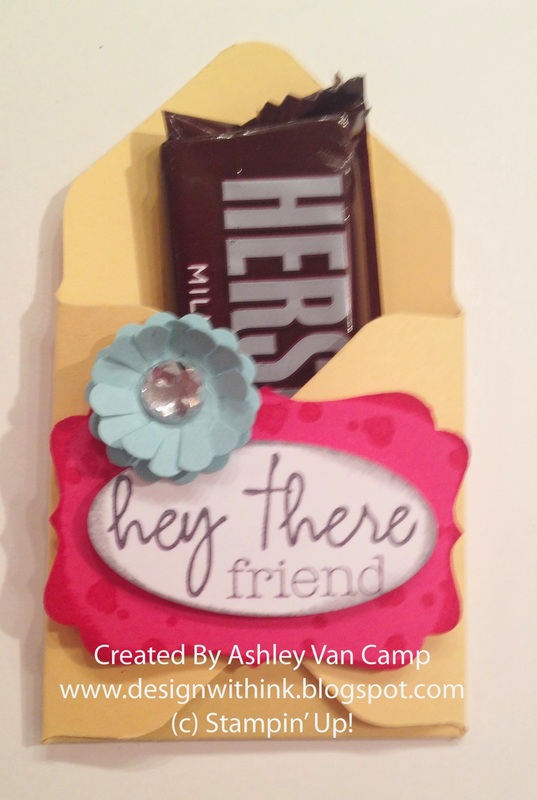 Such a fun and quick gift! 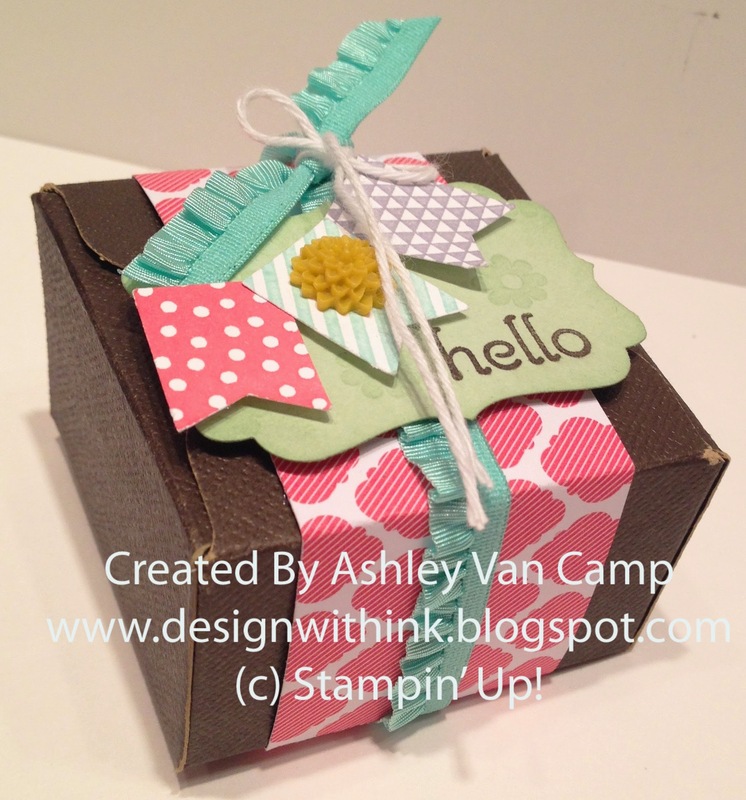 If you would like to order your own kit, just visit my website: www.ashleyvancamp.stampinup.net. Or send me an email: designwithink@gmail.com. Thanks so much for visiting! Hope you enjoy these cards! If you have any questions then just let me know! 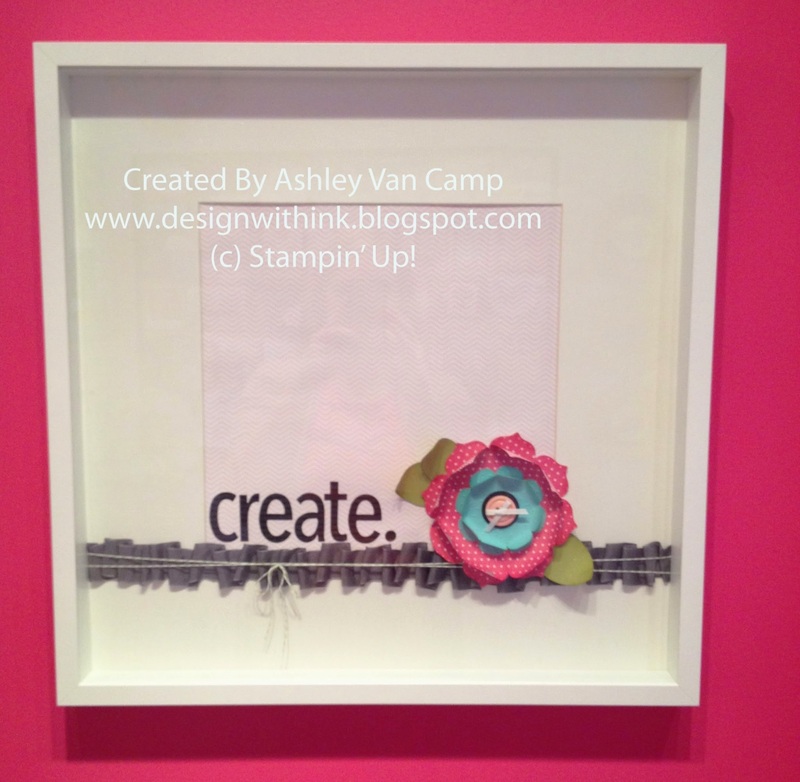 I made a large flower and glued it on a frame that I had framed a piece of Designer Series Paper. The flower was easy to do. It is a bunch of circles that I punched, cut a slit half way up, glued into a cone shape, and then glued them all together. 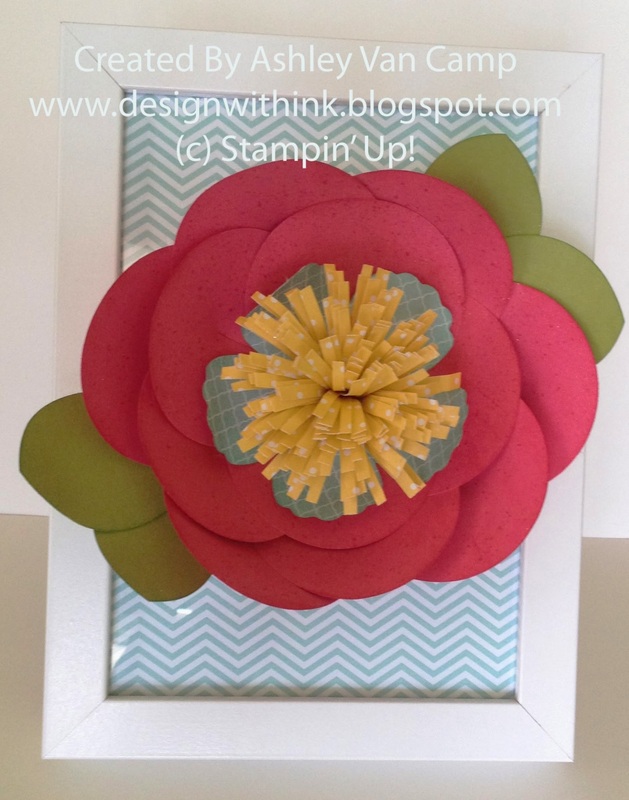 I made a center for the flower with the NEW FABULOUS Fringe Scissors! They are SO much fun to use! The colors are Pool Party, Strawberry Slush, Daffodil Delight, and Old Olive. So fun and fresh! It's a 5"x7" frame...so you can kinda tell the size. It's quite a large flower. Makes quite a pop by the front door. And I love it! Thanks so much for visiting! I hope you enjoy this project! Let me know if you have any questions! Just a reminder...if you sign up by March 31st...you get a FREE pack of In Color markers! You can see more about this in THIS POST. 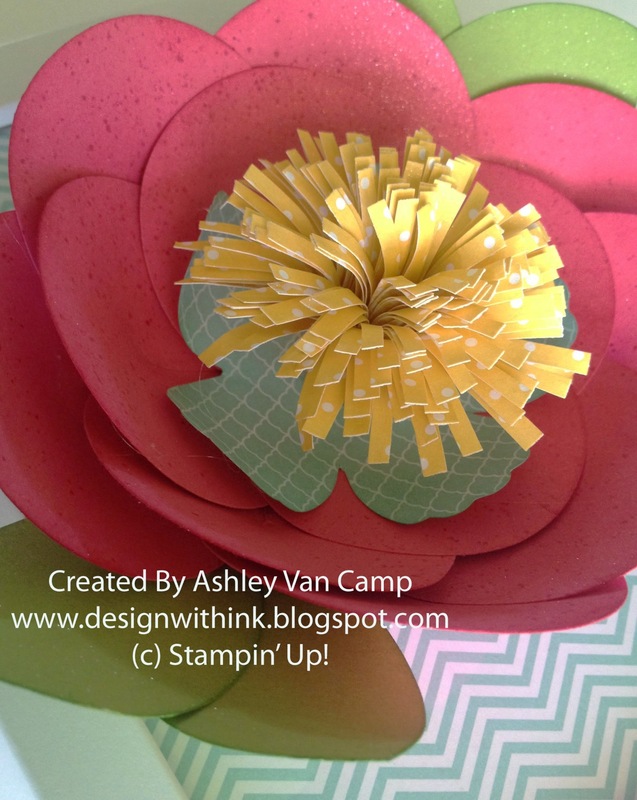 SEE HOW MUCH FUN PAPER PUMPKIN IS!!!! And guess what is even better!? 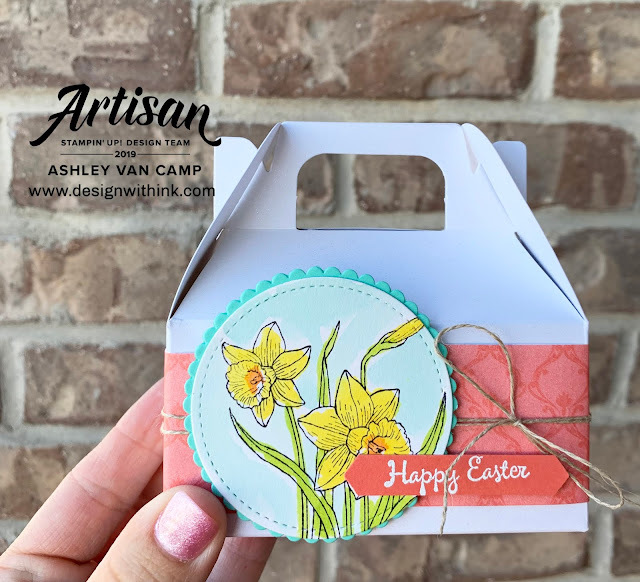 When you subscribe to My Paper Pumpkin and choose me as your demonstrator...you will have access to a private blog with lots of additional ideas for each months kits! How much FUN is that?!?! SO CLICK ON THIS LINK to go sign up now! 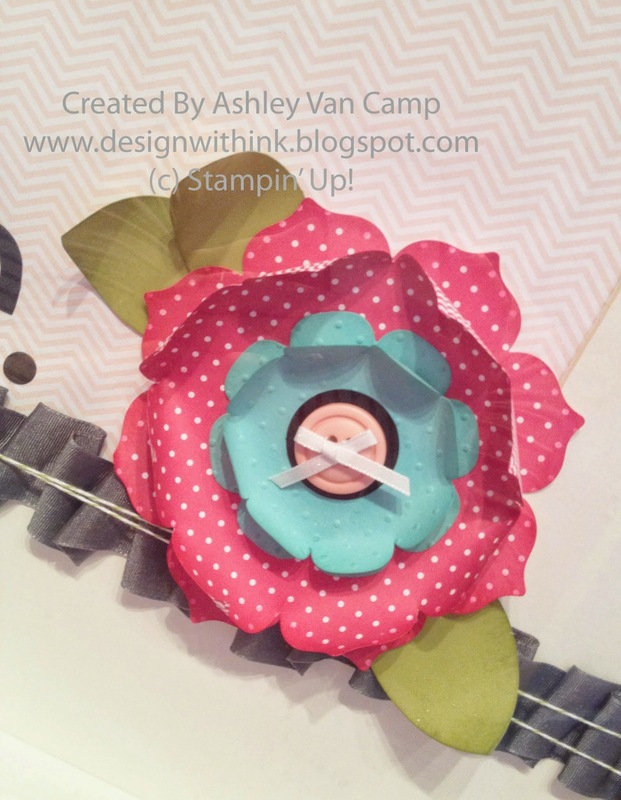 https://mypaperpumpkin.com?demoid=2009104 Feel free to email me: designwithink@gmail.com with any questions! 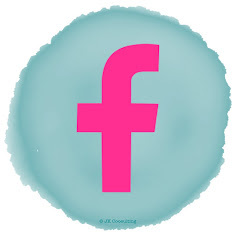 I hope you enjoyed this full post! Let me know if you have any questions! Hope you like the projects! Thanks so much for visiting!!! Fun...right?! And those Banners! LOVE LOVE them! 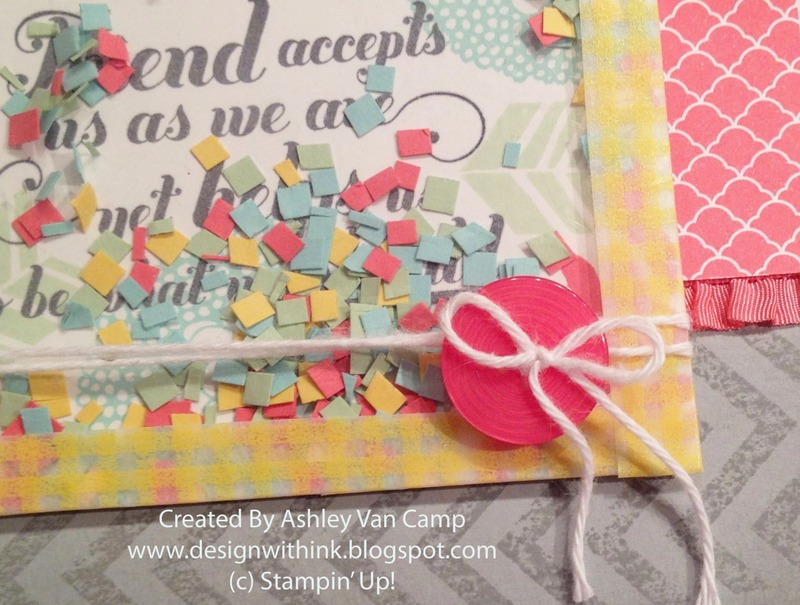 You have until March 31st to earn the Banner stamp set and coordinating punch for FREE! Email me at designwithink@gmail.com for details! 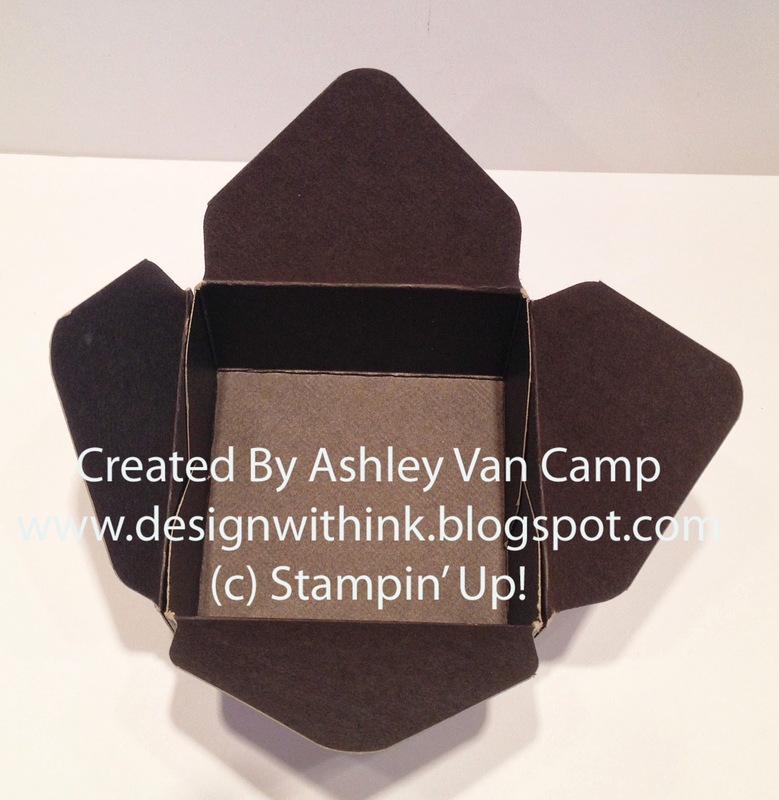 Here is another box I made in the same size as the one above. Hope you enjoy these projects! Thanks so much for visiting! Let me know if you have any questions! The flower is the largest Floral Framelit. It's pretty big in real life. I used a bone folder to curl the edges and make it really pop and such. Hope you enjoy this project! Thanks so much for visiting! 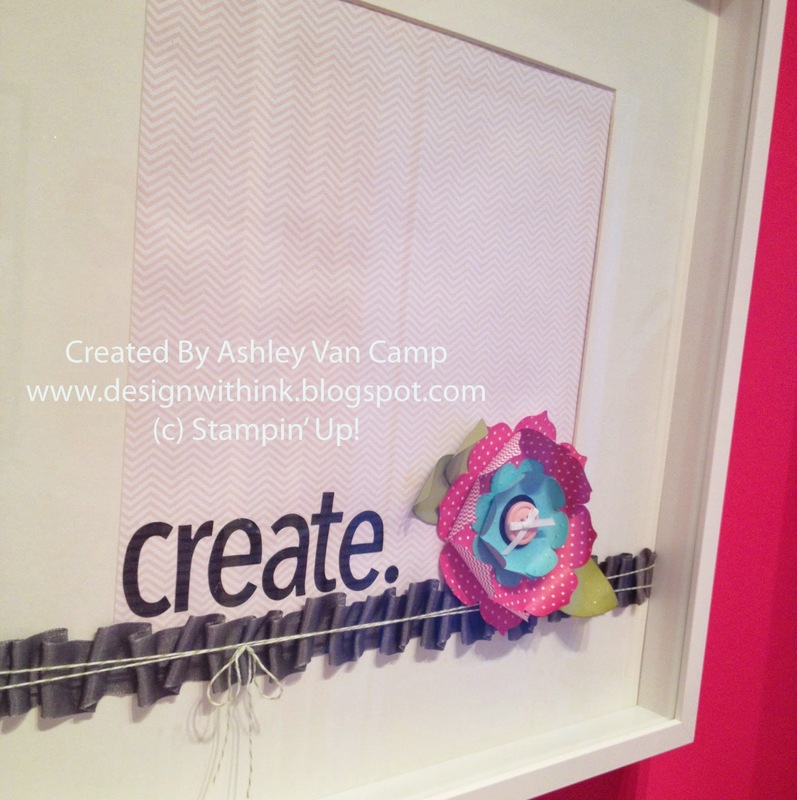 Go create something today! 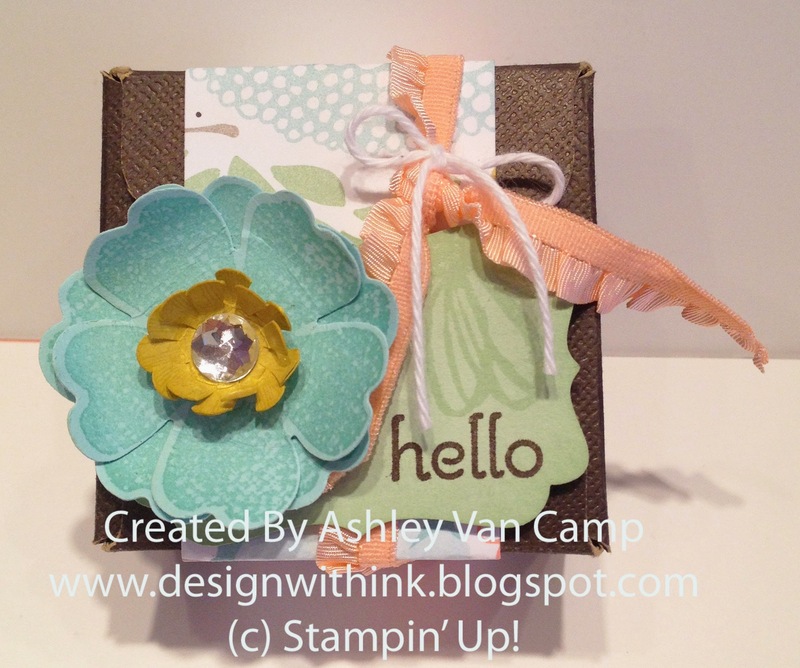 I encourage you to try something new with your stamping stuff! Loving this color combo! It's Strawberry Slush, Basic Gray, Pistachio Pudding, Pool Party and Daffodil Delight. So fun! Lots of fun things you could do with this combo! 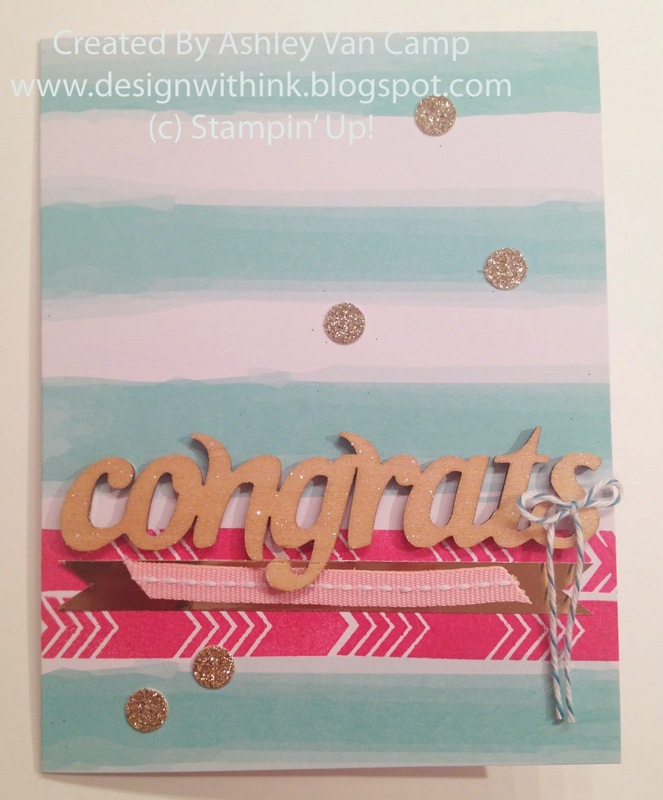 I used two main stamp sets: Feel Goods and Petal Parade (Sale-A-Bration set that you can get FREE until March 31st!) 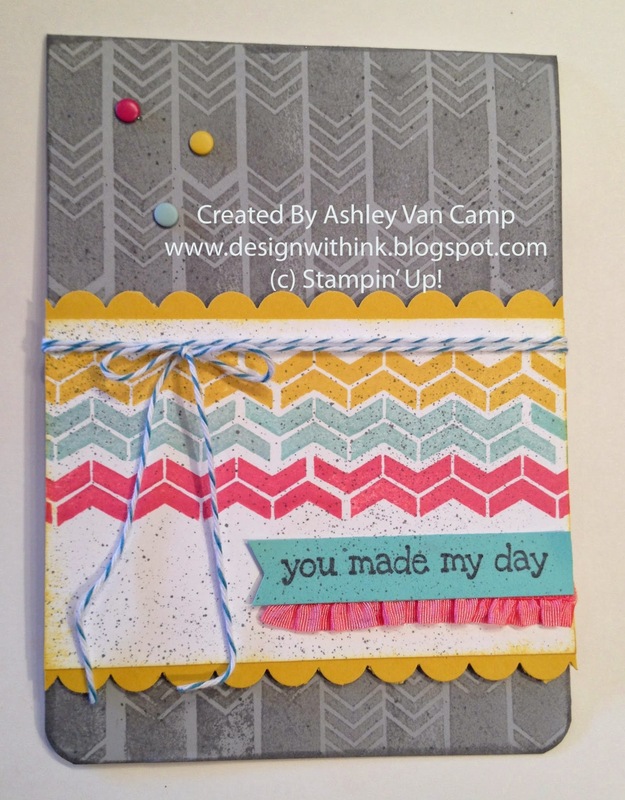 and one background stamp, Chevron. I love how well these sets go together. Have to say... loving that button. 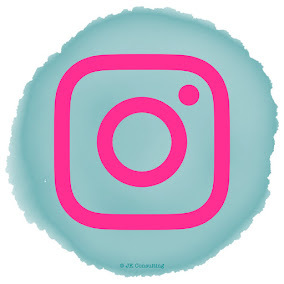 (I LOVE buttons!) This is a Melon Mambo button from the Brights Collection but works great with the Strawberry Slush accents! 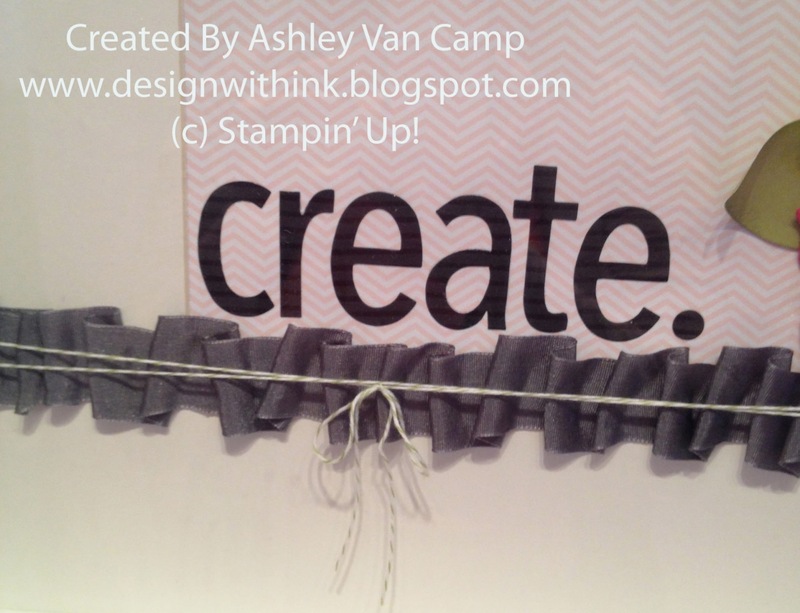 And LOVE LOVE that ruffled stretch ribbon! So much fun to work with! 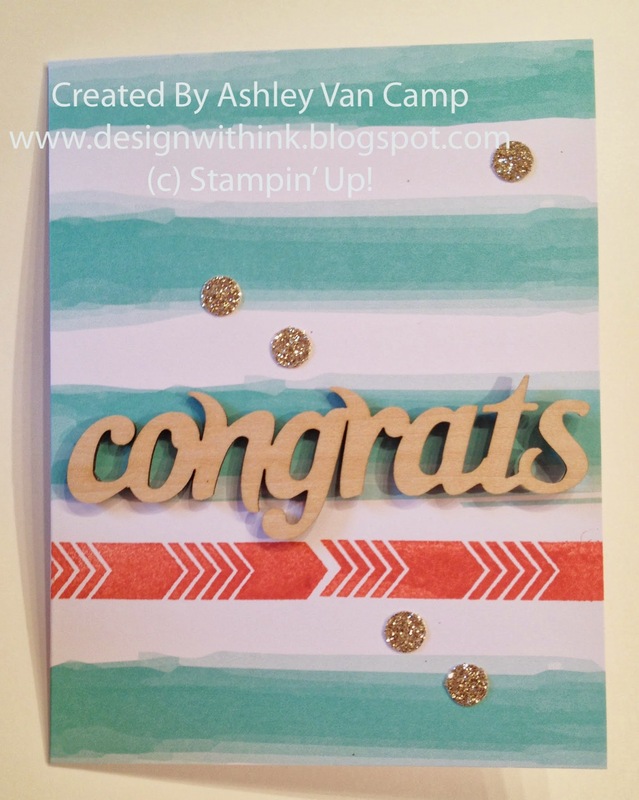 And you certainly can't go wrong with the Chevron background stamp!!! This card was a lot of fun to make! 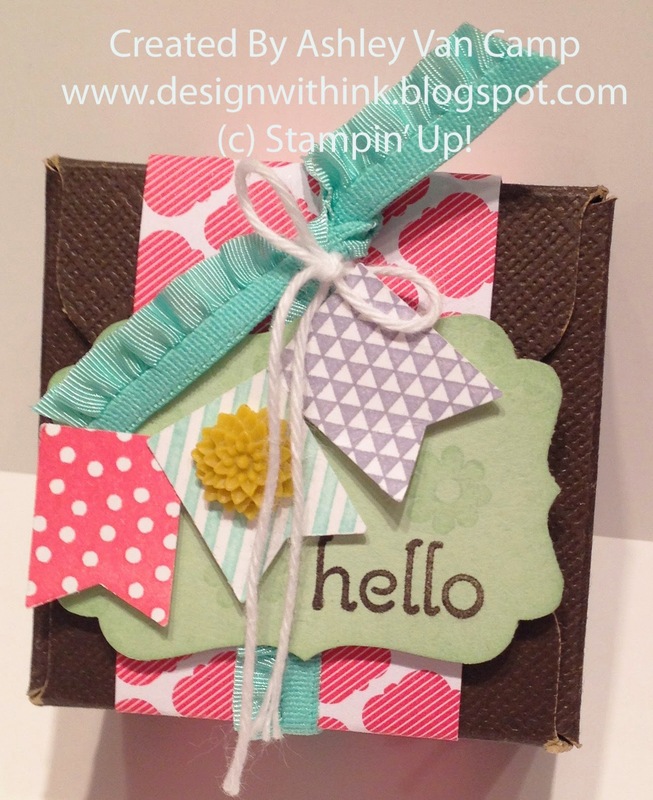 Try one yourself and see how much fun shaker cards are! Thanks so much for visiting! Hope you enjoyed this project! Let me know if you have any questions! Hope you enjoy! Thanks for visiting! Let me know if you have any questions!